Travel routers are extremely useful for those who travel a lot, for business or personal purposes and need to be connected to the Internet at all times. If being online is what helps you make a living, then you definitely need one of these. Unlike smartphones and tablets, laptops cannot connect to the so popular 4G Internet, so owning a wireless router that you can take with you everywhere you go is crucial. Travel broadband routers, by comparison to home routers, do not have to be connected to a power source in order to work, which is why they are so awesome. Are you looking for a travel router that will keep you permanently connected to the online world? Then you must think of the specifications that you need before buying it. When selecting the best models on the market, most people look for products that are small sized, compact, battery powered and that have tethering capabilities. Also, a travel router that can join a hotspot as a Wi-Fi client is much better than one that doesn’t. In order to use a travel router, you have to set it up first and although most models come with clear instructions, you might want to choose one that is extremely easy to use. In that case, you might want to focus on finding a travel router that gets set up in as few steps as possible. To help you choose the best router for your needs, we have reviewed 5 of the best-selling products on the market. Take a look at the 5 products below, analyze their pros and cons and choose the most suitable characteristics for your needs. If you are looking for a travel router with plenty of other capabilities, you might simply love this product. With a compact, thin and modern design, it comes with storage features and media features that are ideal if you are always on the go. It has a file hub that allows you to transfer files using SD cards, USB drives or devices such as smartphones, tablets and even computers. Except for the fact that it gives you the ability to stay connected to the Internet at all times, it also converts wired networks into wireless ones. More than that, it features a media streamer that allows you to share content with other devices on the spot. This device recognizes USB drives and hard disks wirelessly using the RAVPower app, which makes your life so much easier when you work with many devices and accessories at once. It comes with an external battery pack with a built-in chip and 6000 mAh power. This gives you the ability to charge your phone at least once and saves you the trouble of borrowing a charger when yours is not at hand. This product comes in black and white, so you can choose whichever option suits you best. It has a WLAN output and a USB port. It can connect to an existing Wi-Fi network using the bridge mode, which makes it awesome. More importantly, it offers value for money, as it is affordable and performant. By comparison with the first product in our list, this travel router is larger in size and bulkier, but it is still highly portable and suitable for traveling. It is also a bit more expensive, but it comes with powerful specifications. It has a strong and fast connection thanks to its dual band AC750 Wi-Fi. Also, it is capable to stream HD content on all devices. It has a simple switch that helps you change modes and a micro USB port that can be connected to adapters, portable chargers and even laptops. 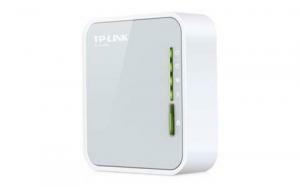 This TP-Link travel router has a 802.11 A/C wireless type, which is the most common type used nowadays. This product measures 2.6 x 2.9 x 0.9 inches and weighs 8 ounces, which makes it small enough to make your life more comfortable when working on the go. It has a nice design, with LED lights that notify the user with regards to its functions and connections. It comes in white, it is elegant and easy to use. Its manufacturer offers a 2-year warranty, which gives it just enough credibility for you to go for this model instead of others. Also, it offers technical support for users 24 hours a day, 7 days a week. 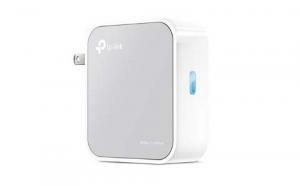 Another travel router from TP-Link comes in a smaller size and at a smaller price. If you are on a limited budget and looking for a high-quality router, then you might want to choose this one. This product fits in your pocket and it is especially designed for traveling. It is able to create Wi-Fi hotspot safely. It can be connected to multiple devices simultaneously and it offers 300Mbps speed on a 2.4 GHz band, which is great for content sharing, online gaming and video streaming. The great thing about this travel router is that it is compatible with Chrome cast. Also, it has great security features, having a pre-encryption function. It sets and SSIS and a password from the beginning, so that you can navigate safely online. This product has a micro USB port that allows you to connect external adapters or USBs to it. Also, it supports several modes, such as router, AP, WISP, repeater and client. Switching the modes is easy and can be done with the simple push of a button. Just like the other TP-Link travel router, this product has a 2-year warranty and 24/7 technical support. If you are looking for a good router that can be carried in your pocket throughout your travels, this 2.2 x 2.2 x 0.7 inches product that weighs 7.2 ounces is perfect for you. Are you looking for a basic travel router that has a USB port and high performance, but you don’t necessarily need hotspot capabilities? Then this affordable product can offer you exactly what you need. It is a small-sized router that can be used at home, in a hotel room or in an office, as it can be connected to a DSL or a modem, it can be used as a Wi-Fi router for smartphones or for connection sharing. Except for being a high-performance travel router, it can also be useful when your smartphone, laptop or tablet are out of power. You can simply connect the charging cable to this product and turn it into a power bank. This travel router has 1 GB RAM, 5V voltage and an 802.11 bgn wireless type. It weighs 096 ounces and it measures 2 x 0.7 x 2.2 inches, which is less than most similar products’ weight. The box contains the router itself, a comprehensive manual and a USB cable. Its weak spot is in the warranty that the manufacturer offers. Comparing to other products, it doesn’t have as much credibility as other products, as it is covered by warranty for one year, instead of two. However, it offers value for money, it is a versatile product, with a basic design and great specifications. TP-Link brings yet another travel router on the market to fulfill the requirements of pretentious travelers who need to stay connected with the online world at all times. This product is a pocket router that can be used as an adapter, a repeater or an AP and that can provide instant Wi-Fi for content streaming, VoIP calls and game playing at a speed of up to 300 Mbps. Thanks to its user guide, it is easy to set up, taking just a few minutes of your time. It has advanced security features such as encryption against hackers and password protection. Also, its modes can be switched in a matter of seconds using a single button. Except for the router and client mode, it also has a range extender mode. Similarly to the other products on our list, it has a USB port that can be used for various purposes and it uses the N300 wireless standard. It measures 2.95 x 3.35 x 1.1 in and weighs only 0.5 pounds. This is probably the most lightweight travel router on the market that has the advanced specifications. If you are already used to travel routers, you will find this product to be versatile and performant. Why is a Wi-Fi portable router better than hotspot? While hotspot is a great way of connecting another phone to the internet, as well as a laptop or any other wireless device, it doesn’t offer the same secure connectivity as a router. This is the main reason why manufacturers still focus on developing some of the best Wi-Fi routers and those who want to connect to the Internet safely still choose to do it using this kind of device. If you think that the worst think that can happen is for someone to steal your Wi-Fi password, think again. Hacker attacks take place all the time. Sometimes your connection can be attacked just for the fun of hackers, but others times your personal data, as well as bank details can be triggered. Working, browsing or simply socializing online can be very dangerous without a safe connection these days. The advantage that routers have over Wi-Fi hotspot connections is a strong firewall, password protection control and encryption. If you are traveling a lot and you figured that you didn’t need a separate device to stay online, you might want to analyse the risks and consider buying a portable router. Such a device is extremely practical, easy to setup, very easy to connect to and comes with a compact shape and a size that is perfect for traveling. Will I be able to access the Internet from everywhere? A portable router offers high-quality connectivity, but its limitations depend on its operator, as well as on its specifications. If the characteristics of your router are strong enough, you will be able to stay connected at all times. Don’t forget that this is an aspect that also depends a lot on the Internet provider, so the signal coverage should be wide if you want to use the Internet in a remote location. Just like activating the hotspot function on your phone, you get to share the Wi-Fi connection with other devices, using a password. Another advantage that a portable router has is its multifunctionality. In most cases, it can be used as a router, an access point and a wireless client. If you are planning on using one internationally, you should first make sure that the model you chose is unlocked and that it has the right speed for your needs. How big is a travel router? Routers used to be big and bulky, but their design has changed a lot over the years and manufacturers went more and more towards a compact shape and a small size. 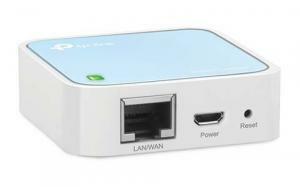 Nowadays, a portable router can fit in the palm of your hand, in your pocket and in any bag. You can barely feel it when traveling, which means that you will be using the Internet safely, without even using your phone’s 4G connection. Most travel routers are small and lightweight. If you, however, find a heavier one, you should check its specifications. It might be a home model and not necessarily a travel router. Owning a travel router that adapts to your needs is extremely important if you are one of those travelers who combine work with leisure. Internet connections can be found everywhere nowadays, but they don’t always offer you the speed that you need. Imagine being in a hotel room with a poor Internet connection and having to finish a report for work. This simple scenario is frustrating enough to determine you to choose one of the best travel routers on the market. Luckily, there are many options to choose from on the market. The above travel router models are some of the most popular out there. We have chosen them based on their price, technical characteristics, design and portability. Also, the technical support and warranty that the manufacturer offers are important factors that might influence your decision. No matter what you choose, make sure that it is a durable product, with a great price and specifications that meet all your requirements.